Recent events from the land of the Telugus, which is currently known as has Andhra Pradesh, have troubled me a lot. As a person with Telugu roots, and an advocate of Telugu unity I had enough of this nonsense. It is time to call a-spade a-spade! For years various websites have sprung-up spreading a bunch of lies and misinformation about the imaginary injustice caused to the Telangana region by the people from the Kosta region. A pseudo intellectual person at best, and a hate-monger at worst, has become the brains of this movement that was built on a platform of lies. This misinformation has manifested itself first as resentment and now as full-blown hatred against people hailing from the Andhra and Rayalaseema region. Unlike some hate-mongers who have been methodically spreading their misinformation and jealously guarding their fortresses of lies, there is no concerted effort to counter this nonsense. I want to do my part in squashing these lies with truth from verifiable sources – not with “feelings” and bad personal experiences a few people. My motto: fight lies with truth; put a mirror in front of those who are burning with hate. This multi-part article is one such attempt. This article is from a book by Mr. Nalamotu Chakravarthy, My Telugu Roots (republished here with permission). The separatist leaders of Telangana frequently claim that, since the integrated state’s formation, the region has suffered because of exploitation by the people from the Kosta region. No evidence proves Kosta region’s deliberate discrimination against Nizam Telangana. Saying that, from an economic standpoint, there is no denying that the Nizam Telangana region is marginally behind the Kosta region. The main reason for the region’s backwardness was the severe beating that the economy took under Nizam’s rule. Ever since the formation of the integrated state of Andhra Pradesh, the Nizam Telangana economy grew at a faster pace than Kosta or Rayalaseema. However, separatist leaders hide this fact to incite people of one region against the other. Instead of harnessing the strengths of each region, separatist leaders of Telangana demand parity in every aspect with the Kosta region, when there are variations in geographical constitution of these regions making parity across different sectors an impossible goal to achieve. The former Vice Chancellor of Kakatiya University, Professor Jayashankar, is often mentioned as the brains behind the separatist movement. He wrote a paper titled “Telangana Movement — The Demand for a Separate State” that is often cited by the Telangana proponents to make their case for a separate state. In this paper, Professor Jayashankar blatantly distorts facts to further his argument for a separate state. In this chapter, I will present statistical data questioning the claims of separate state proponents. For this socio-economic analysis, I primarily focus on education, irrigation, industries, and financial sector data. I relied on statistical abstracts of Andhra Pradesh for the data presented in this chapter. When I relied on other sources of data, I have provided explicit footnotes. To compare how each region performed since the state formation, I used data for the 1956 and 2001. 1956 was the year when the state was formed, and 2001 was the year when the last census data was collected. The Indian government publishes a census every 10 years, and I used the 2001 numbers as the most recent benchmark. Of course, 2011 census numbers, when they become available, will certainly offer a more telling story. In addition, as I present data for each region, where available, I offer a separate category for Nizam Telangana, excluding the city of Hyderabad. The capital city, Hyderabad, with its large population tends to skew the results of our analysis. I, therefore, tried to provide readers a perspective on how the Nizam Telangana districts perform economically when we exclude Hyderabad city. Without further ado, let us jump straight into the analysis that helps us understand how each region performed over the past 50 years. Let us start our analysis with the school education category, and Table 1 compares how each region performed relative to each other. 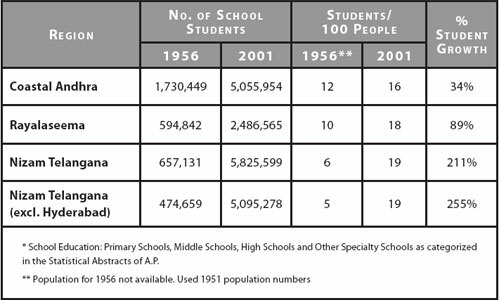 In 1956, when the integrated state of Andhra Pradesh was formed, for every 100 people in the Nizam Telangana region, 5 were in the school system. Compare that to 12 in Kosta and 10 in Rayalaseema. By 2001, the situation changed dramatically, with Telangana having 19 students for every 100 people in the school system, surpassing Kosta’s 16 and Rayalaseema’s 18. Next, let’s look at another category—graduate education. Table 2 provides the relative performance of each region since 1956. Yet again, the Nizam Telangana region that was well behind the Kosta region in the number of graduate students has raced past the coastal regions. 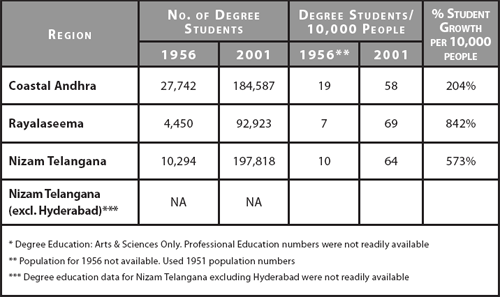 In 1956, for every 10,000 people, there were 19 degree college students in the Kosta region, whereas there were 10 in the Telangana region. Today, the situation is reversed. Telangana boasts of 64 degree students for every 10,000 people, surpassing Kosta’s 58.. 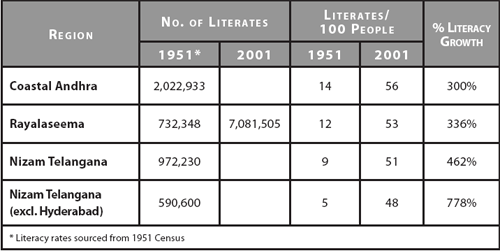 Professor Jayashankar, in his paper, says, “…after 47 years (since the state formation) the literacy rate in Telangana continues to be lowest in the state.” To make his case, Professor Jayashankar presents the 2001 literacy rates. Table 3 provides the number of literates in each region. As you can see, Nizam Telangana (excluding Hyderabad) has a 48% literacy rate, compared to 56% in Kosta and 53% in Rayalaseema. However, these numbers do not paint a complete picture. As of 2001, Telangana region had made significant strides in literacy. Despite initially being behind the other two regions, Telangana region attained a substantial 778% growth compared to the ~300% growth realized in the Kosta and the Rayalaseema regions. Percentages, in some cases, tend to exaggerate the growth rate. Let’s look at the absolute numbers. Between 1951 and 2001, Rayalaseema added 41 new literates for every 100 people, and Kosta region added 42 additional literates for every 100 people, whereas Telangana added 43 literates for every 100 people. There is no denying that Telangana is behind the other regions when it comes to the literacy rate. However, it is important to note that the legacy of a low literacy rate in the Telangana region goes back to the Nizam’s rule, when only 5 in 100 people could read or write. Clearly, the statistical data on education does not back up the claims of exploitation being trumpeted by the leaders of the separate Telangana movement. The key takeaway of this analysis is that the Nizam Telangana region, in education, is developing at par with the Kosta region, and despite it, intellectuals such as Professor Jayashankar will continue to find issues by cherry-picking the data that supports their fanatical agenda. Just finished reading the 19th chapter. Let me tell you, the real fight must be for Rayalaseema. Poor Rayalaseema is last by all means.